Today I'm sharing this easy Recycled Hibernating Bear Craft! It's a great way to teach kids about their natural world using some creative arts and crafts fun! Let's Make this Hibernating Bear Craft! Then, I cut out a cave opening from a large brown shopping bag. We looked at pictures of caves and turned our bag into a cave by gluing on various items like twigs, popsicle sticks, cotton rounds (aka "snow"), and "rocks" (which we cut of paint chips). He also added some green moss to the cave too. It took about a day for everything to dry. Then, I popped open the bag, folded the top over, and stapled it shut. Voila! Now we had an instant cave for his bears to sleep in. I hope you have a fun time trying out this fun nature-themed craft with your kiddos too! Let's keep learning about animals and hibernation! 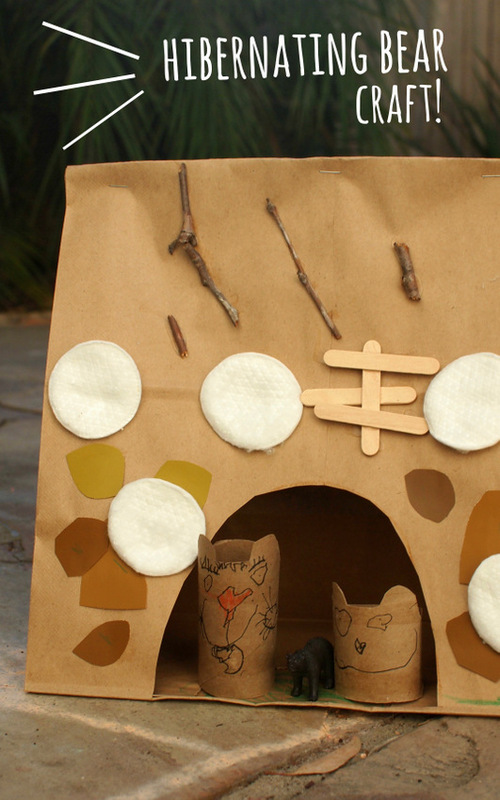 Here are some more fun and easy preschool hibernation-themed activities.